22 November 2018: Supple and translucent, pliant yet strong – the Namako installation on Aspen Island is a paradigm-shifting project conceptualised by leading Japanese architect Kengo Kuma and brought to life by architecture students from the University of Canberra. 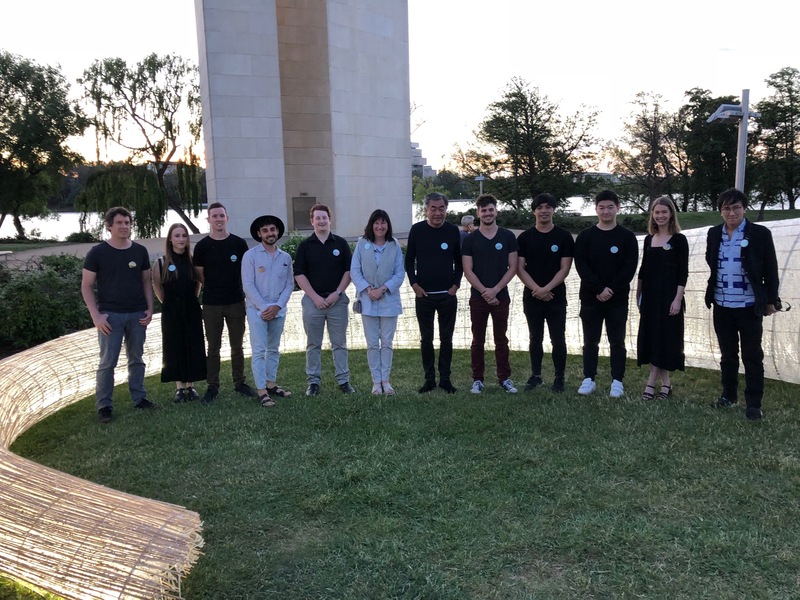 Part of DESIGN Canberra 2018, the inaugural ephemeral architecture project coils on the island in the middle of the capital’s Lake Burley Griffin, neighbour to the sonorous resonance of the National Carillon. It’s the result of an international collaboration, with Professor Kuma himself, and the architecture student cohort at the University of Tokyo KumaLAB. Ephemeral architecture is a concept which takes the life of a design into account, as much as its form; it engages with time and whoever is experiencing the design, as well as materials, context and location, and lends itself to change, experimentation and innovation. 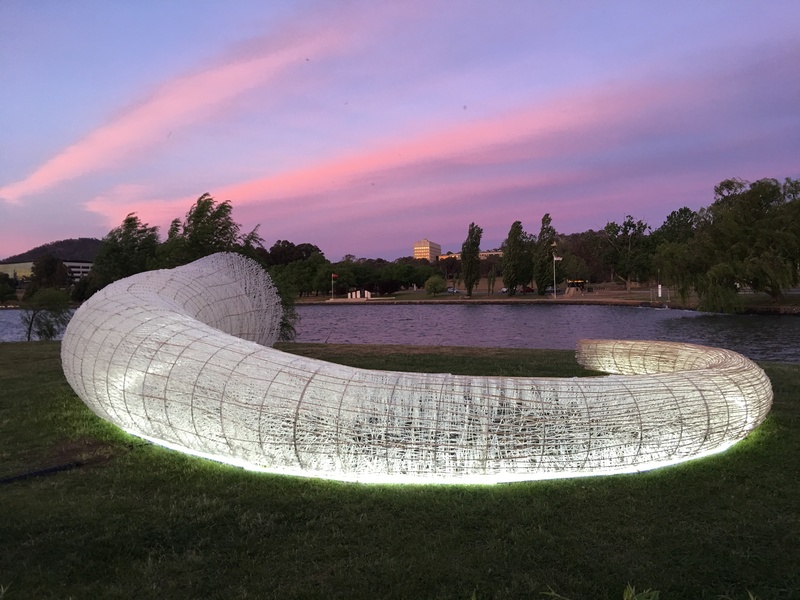 DESIGN Canberra’s ephemeral architecture project was envisioned by Rachael Coghlan, CEO of Craft ACT and the festival's Artistic Director. “As we intertwine material and temporality, our understanding deepens towards an architecture of time and place, where the interrelation between the material and the immaterial, the known and the not-yet-known is prescient, embodying in Kengo Kuma’s words an ‘ambiguous condition’,” said Ann Cleary, University of Canberra Senior Lecturer in Architecture and project co-lead. The installation is a sinuous structure of bio-acrylic rods and zip ties, the latter undulating in the slightest breeze. 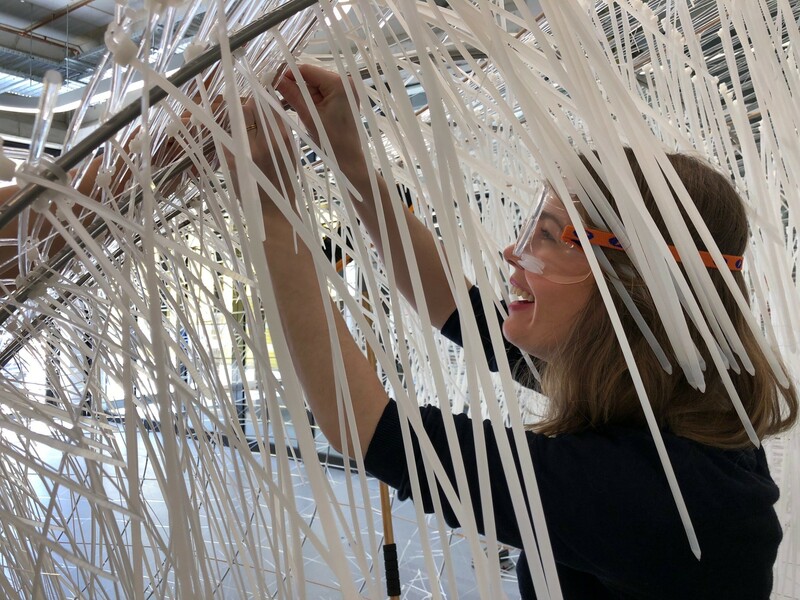 “When the wind blows through the zip-ties, they sound like leaves, adding another dimension to the interaction,” said Stephanie Cooper. Pursuing a Master of Architecture, she is one of the students who built the installation, with Kuma’s philosophy underlying the interpretation. ‘Namako’ is the Japanese word for ‘sea cucumber’, a creature which embodies the soft, supple nature integral to the project’s design, its inspiration clearly seen in form and feel. The installation is set to spark new neural pathways when it comes to design. Kuma himself has ruminated that bodies are made up of many soft layers, covered by the further layers of clothes – architecture as fibre can add even more layers. “Taking this position seriously could dissolve the oppositions between architecture and the body, between architecture and landscape, and between the natural and artificial,” he has said. “The temporal nature of the project grounds it within Canberra’s legacy, as both an ancient place and a contemporary design ideal,” said Ms Cleary. Further anchoring it to place is the use of wood from native Australian eucalypts, replacing the bamboo that was used in the prototype built earlier this year in Japan. 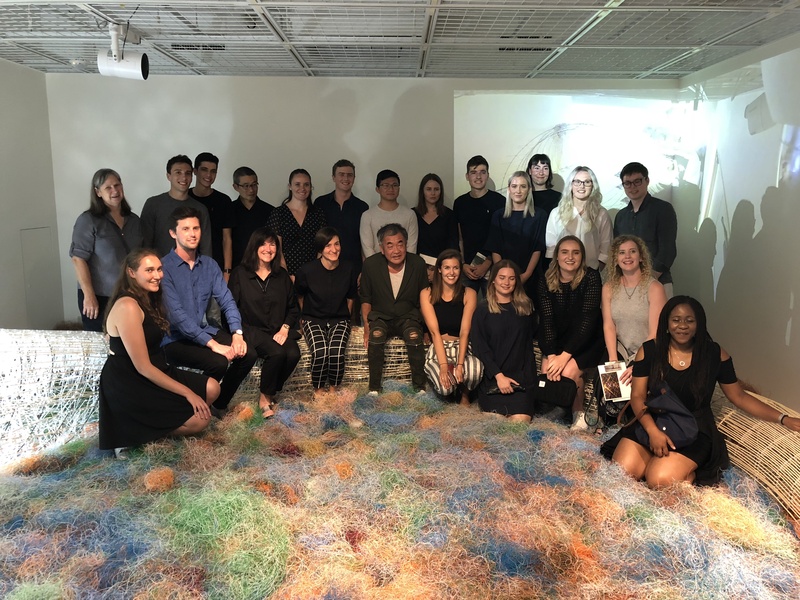 Ms Cleary accompanied a cohort of architecture students to Tokyo, where they collaborated with students from KumaLAB (Kuma’s research laboratory) on Professor Kuma’s ‘reckless weaving’ technique for the prototype, exhibited at Lixil Gallery Ginza. “This project aims to go beyond the ideas of simple assemblage and explore methods of shaping architecture for experiential awareness,” said Dr Milica Muminovic, Assistant Professor of Architecture and the co-lead on the faculty-led program to Japan. Back in Canberra, a different cohort of students then built on this intercultural exchange. Professor Kuma's concept of 'reckless weaving' was used to create Namako's sense of fluid movement. “We refined the structure further for the outdoor setting, using double rings of stainless steel at segmented junctions and introducing a tension sleeve of filament,” said Bethany Daniel, who is pursuing a Master of Architecture. Its creators are particularly interested in seeing how people experience the installation. The University of Canberra is proud to be a platinum partner of DESIGN Canberra. Namako was launched by ACT Chief Minister Andrew Barr, with Ms Coghlan and Professor Kuma. It remains on Aspen Island till 25 November; this year marks the 25th anniversary of Canberra’s sister city relationship with Nara in Japan.